← Screen printing in Phoenix biggest question. Why do companies get some orders, and lose out on others? The blue glow in the dark bouncing balls will provide hours of glow in the dark entertainment! Each ball measures approximately 1.5 inches in diameter, and they glow 1 time, for 6+ hours. Each package includes 2 balls and 2 glow sticks (1.5 inches long each); to activate the item, simply snap and shake the glow stick, and then insert it into the ball. Each box includes 1 package (2 balls). Have you ever been in a store and your kids are just making a scene by screaming and yelling? Believe me I have. I wish I had this amazing item in my hands at that exact moment because it would’ve stopped all of the commotion, and I would have saved the embarrassment for another time. What makes this product so great is that it can occupy kids for the longest time, because it has a cool bright flashing light on the inside every time you bounce it. 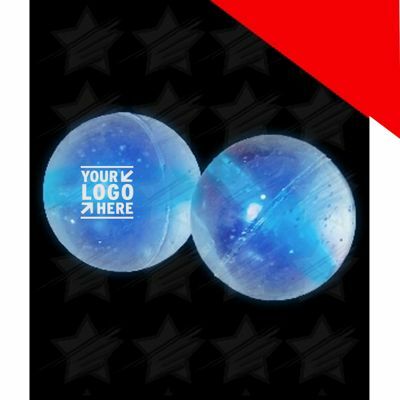 This can also be a great item for a business promotional handout event because you can put your company’s name or logo on the outside of the bouncy ball. This ball also comes in many different colors like blue, green, pink, and red.